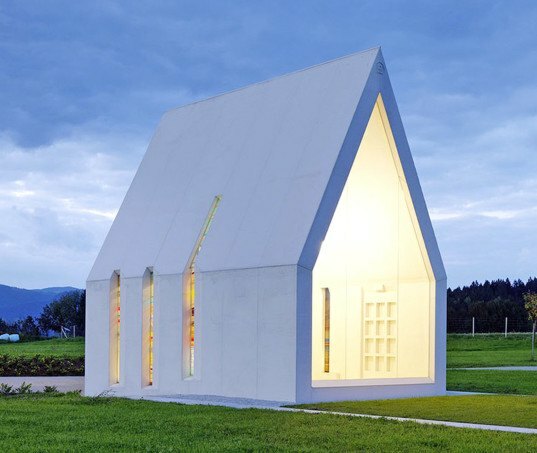 Sacher.Locicero.Architectes designed a stunning yet simple white chapel in Zollfeld, Austria that’s certain to catch the eye of passersby. 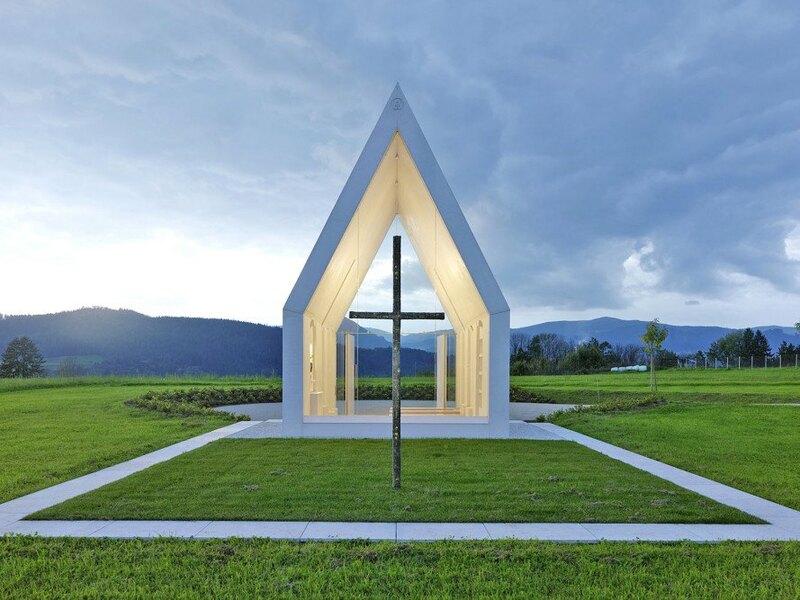 Completed last year, the 27-square-meter Maria Magdalena family chapel is a sculptural modernist building that punctuates the rolling green hills of the Austrian countryside. Its minimalist shape and position in the landscape give the structure a sense of tranquility and timelessness. The Maria Magdalene chapel was constructed from self-compacting concrete (SCC) with a radiant white color that reflects changing light and weather conditions as different colors, from a bright glossy white on clear midday to a matte bluish-white at dawn. The chapel’s contemporary single-gabled volume was distilled from the classic chapel form. The glazed gabled end-walls and transversely-cut stained glass windows on the side walls fill the interior with natural light and frame uninterrupted views of the bucolic landscape. Religious references are found throughout the chapel, from the six days of genesis depicted in the stained glass windows to the large outdoor bronze cross that represents the last day of genesis. The dark bronze cross creates a strong contrast against the chapel’s pure white. Inside, the floors are lined with cream and beige travertine tiles. Alcoves located along the walls flanking the choir hold a statue of Maria Magdalene and 12 small urns. At night, the chapel glows from the inside and is illuminated via fitted spotlights and hanging translucent cylindrical lamps. The Maria Magdalene chapel was constructed from self-compacting concrete (SCC). The white chapel reflects changing light and weather conditions as different colors, from a bright glossy white on clear midday to a matte bluish-white at dawn. The chapel’s contemporary single-gabled volume was distilled from the classic chapel form. Religious references are found throughout the chapel, from the six days of genesis depicted in the stained glass windows to the large outdoor bronze cross that represents the last day of genesis. The dark bronze cross creates a strong contrast against the chapel’s pure white. At night, the chapel glows from the inside and is illuminated via fitted spotlights and hanging translucent cylindrical lamps.